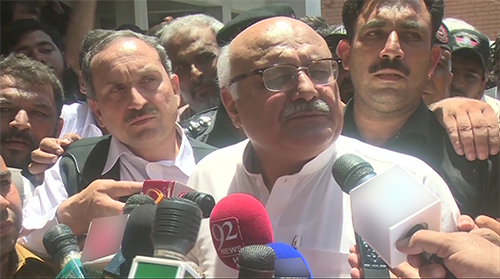 NOWSHERA (92 News) – Slain Pakistan Tehreek-e-Insaf’s (PTI) worker Habibullah’s father Sher Alam on Monday denied nominating Awami National Party (ANP) Central Secretary General Mian Iftikhar in the murder FIR. As per reports, Sher Alam said that Iftikhar is not involved in his son’s murder. While recording his statement in the court, he said that he had not nominated the ANP leader in the case. However, the court sent the ANP leader on a one-day judicial remand. He will be presented before court tomorrow (Tuesday).